Schematic diagrams of the bodies of animals with coeloms, with pseudocoeloms, or without body cavities. functions of body cavities. Humans have four body cavities: (1) the dorsal body cavity that encloses the brain and spinal cord; (2) the thoracic cavity that encloses the heart and lungs; (3) the abdominal cavity that encloses most of the digestive organs and kidneys; and (4) the pelvic cavity that encloses the bladder and reproductive organs. The cranial cavity cushions and protects the brain within a rigid skull. The other body cavities also cushion internal organs, but instead of being rigid, they have to be flexible for the heart, lungs, digestive organs, and reproductive organs to expand. In humans all but the cranial cavity develop from the coelom (pronounced SEE-lum). A coelom is a cavity that is entirely enclosed within cells derived from the middle layer of embryonic tissue. A few groups of animals, such as roundworms (Nematoda), have a body cavity that is only partly enclosed by tissue from the middle layer. Such a body cavity is called a pseudocoelom (pronounced SOO-doe-SEE-lum). In a few other groups, such as flatworms (Platyhelminthes), there is no body cavity. Pechenik, Jan A. "Classification by Developmental Pattern." In Biology of the Invertebrates, 4th ed. Boston: McGraw-Hill Higher Education, 2000. 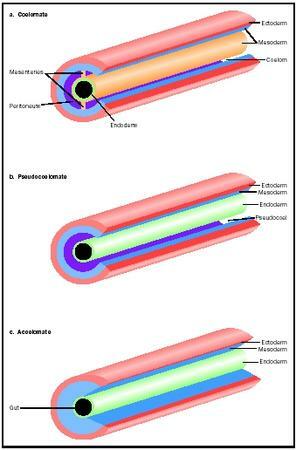 Saladin, Kenneth S. "Body Cavities and Membranes." In Anatomy and Physiology. Boston: McGraw-Hill, 1998.